DA Form 3479-9 - also known as the "Atc Maintenance Personnel Certification And Related Training Record" - is a Military form issued and used by the United States Department of the Army. The form - often mistakenly referred to as the DD form 3479-9 - was last revised on October 1, 2010. Download an up-to-date fillable PDF version of the DA 3479-9 below or request a copy through the chain of command. 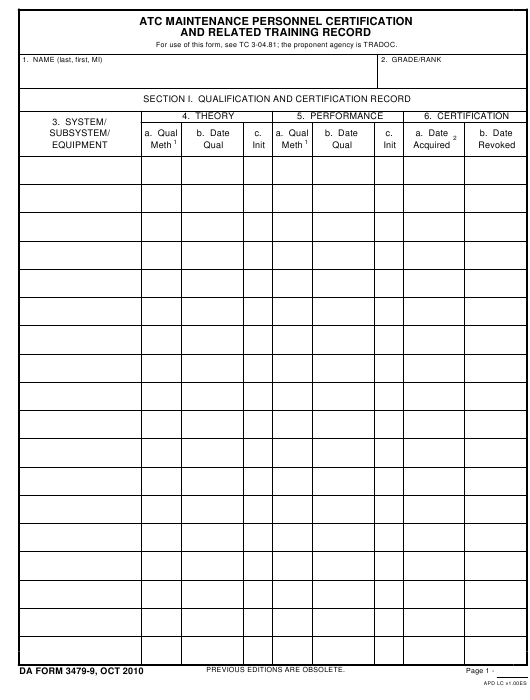 For use of this form, see TC 3-04.81; the proponent agency is TRADOC. examination, PC for prior certification, and NTRN for nonresident training. If other than regular certification, enter I for interim. Enter C if action pertains to concepts (theory) or P if action pertains to performance. Enter P for passed or F for failed.